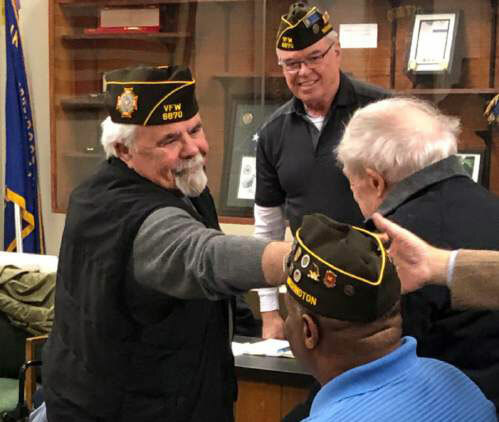 Members of the post welcomed our newest member, Herb Bender who was inducted at the January Post meeting. Herb was sponsored by member Jay Hansen. Herb, at left in this photo, is a Navy Veteran who served in Vietnam, is currently a resident of Mukilteo and retired from Boeing. During his eight years in the Navy, his rating was Radarman with a terminal rate of E-5. Herb’s service put him aboard a wide variety of ships, from aircraft carrier (USS Oriskany) an assault cargo ship and a guided missile destroyer, including a 30 day TAD to the brown water Navy in Vietnam aboard a river patrol boat.